Jerry Bookwalter graduated from UC Davis in the 1960s and worked in California viticulture before heading north to Washington State in the 1970s. He spent time in the San Joaquin Valley before getting the urge to venture up north. Bookwalter had a hand in planting three famed, highly-regarded Washington State vineyards: Sagemoor, Dionysus and Bacchus. 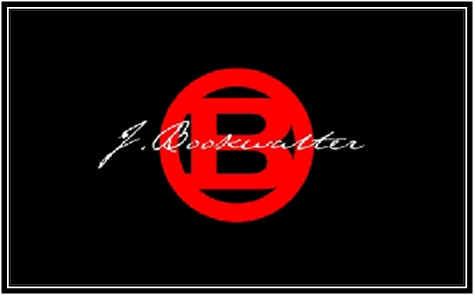 He became the manager of the Connor Lee Vineyard and grapes from that property are the backbone of the J. Bookwalter wines. By the mid-1980s he was dabbling in winemaking and his wife Jean was their business manager. Somehow they managed to stay afloat, despite the challenges of the industry. We visited the place around the year 2000 and it was a smallish enterprise with a number of good wines. By the end of the 1990s, their son John came on board after a decade in the beer and wine biz. 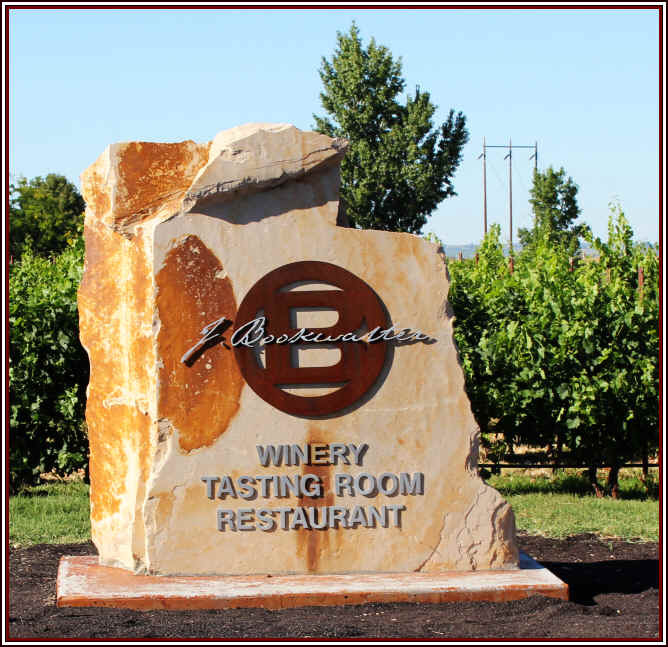 California's Zelma Long was a winemaking consultant for nearly a decade and helped the Bookwalters establish a track record for good quality wines. 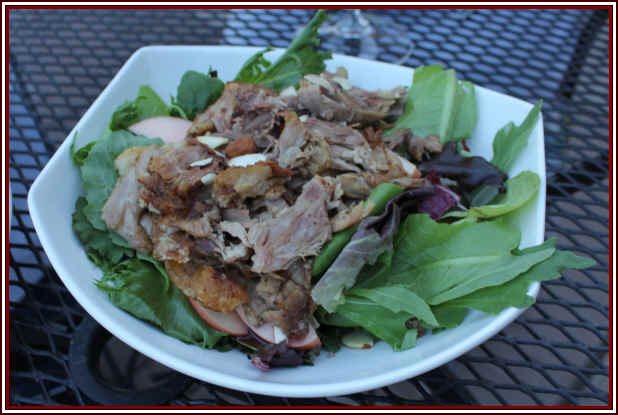 The winery is located in Richland, Washington, not far from Walla Walla. This is about halfway between Walla Walla and Yakima. These days John Bookwalter runs the show with winemaker Caleb Foster. John had spent about a decade learning about the world of beverage sales. He graduated from E&J Gallo's "university" and also had a stint with a major beer company and an outfit which dealt in bottled waters and other associated beverages. Foster, though not a "grey beard," has more than two decades of experience in Washington winemaking. He worked for Rick Small at Woodward Canyon for eight years before working a year with the Ste. Michelle organization. 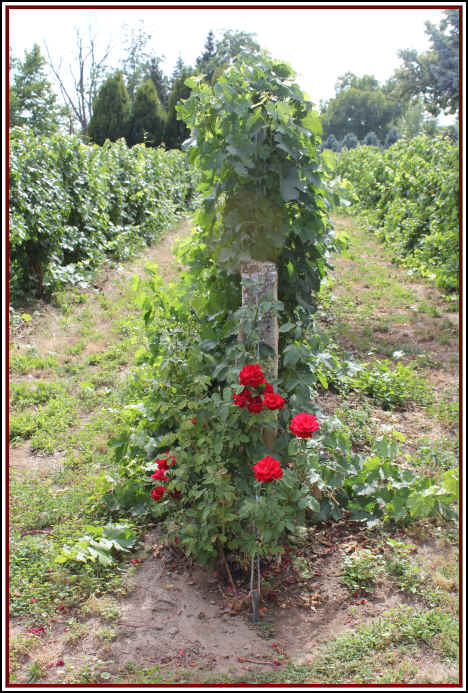 From there he worked with his (then) wife, Nina Buty in making "Buty" and the "Beast" wines. He joined Bookwalter in 2014 and is making some really top wines. We have their 2013 "Foreshadow" Merlot in stock. This is a full-bodied, big, dark, intense red. 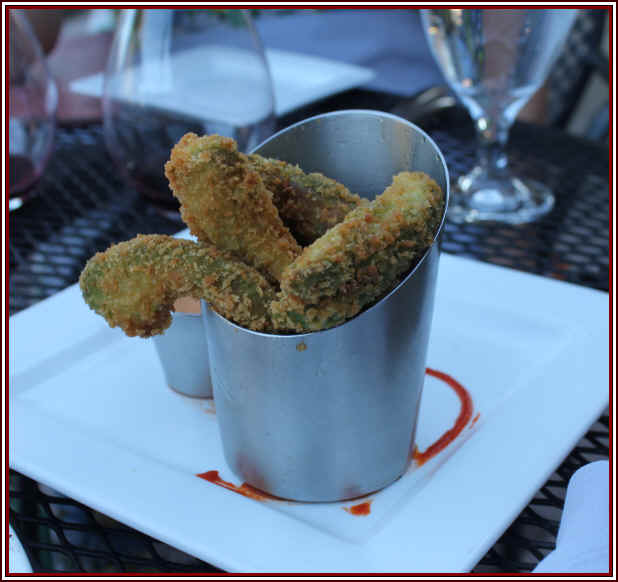 The grapes come mostly from the Connor Lee vineyard with 5% of the grapes coming from Sagemoor. The wine is fortified with 17% Malbec and 6% Syrah. They use a modest percentage of new oak for this wine and we like the balance of fruit and wood here. 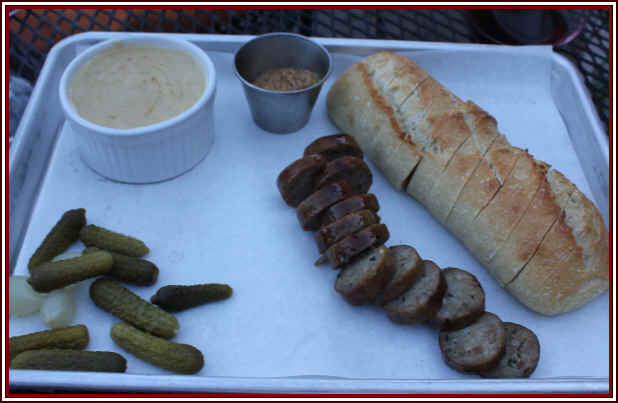 It's quite drinkable now and especially showy with grilled or roasted red meats. This is about the weight and intensity of a Cabernet. They make a number of proprietary blends...we found their 2013 "Suspense" to be of interest. The fruit comes entirely from the Connor Lee Vineyard and the blend is 60% Merlot with 40% Cabernet Franc. It's an impressive and full-throttle red wine. They employ a cold soak to the juice, leaving the skins in the liquid for a few days before allowing it to warm so the yeast can become active and do their job of fermenting the sugar. 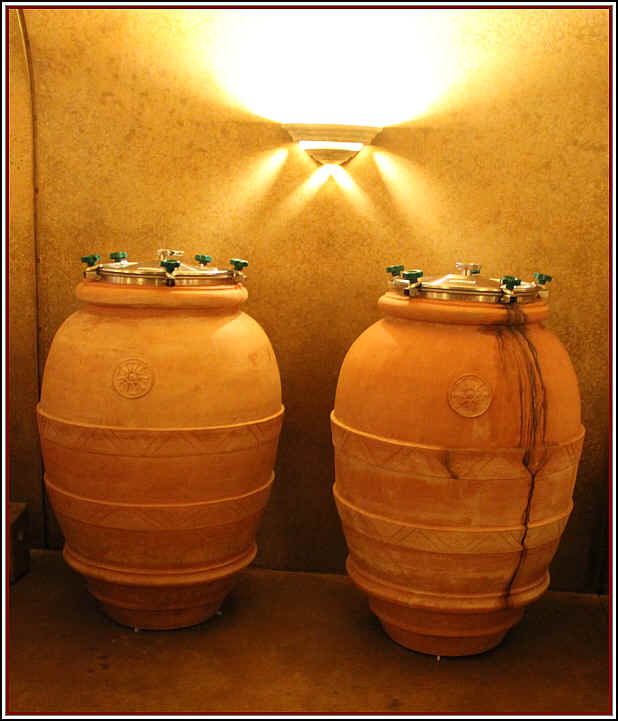 After a two week period for the fermentation, the wine was transferred into small French oak barrels and puncheons. 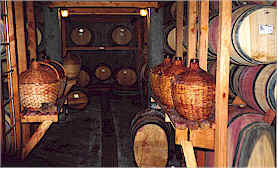 The puncheons were brand new and the barrels were used, so they've done a nice job in balancing the fruit with the oak. It's a fairly full, robust red and you can easily put it on the dinner table to enjoyment tonight. Bookwalter has a nice restaurant at both venues, so you can extend your "tasting" of their wines into a "drinking" of their wines. 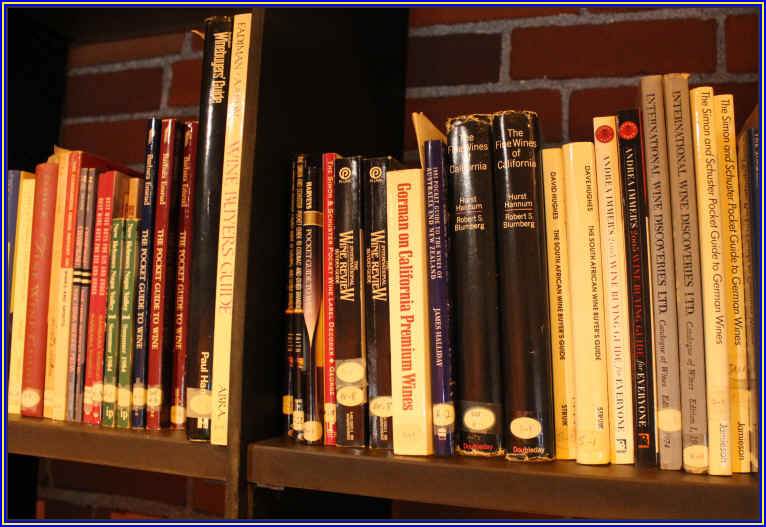 We booked a table at their Richland facility and they have a nice wine list of Bookwalter wines. Gary and Nancy Figgins are two of the real wine pioneers in the story of wine in Washington State's Walla Walla wine region. 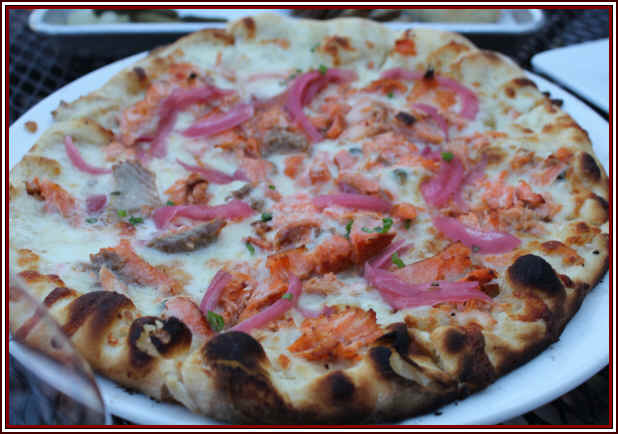 Figgins was a machinist back in the 1970s and his grandparents, the Leonetti family, had come to Washington from Italy's Calabria and had a little azienda in the Walla Walla area. They emigrated in the early 1900s and landed in what was to be a most fortuitous location. 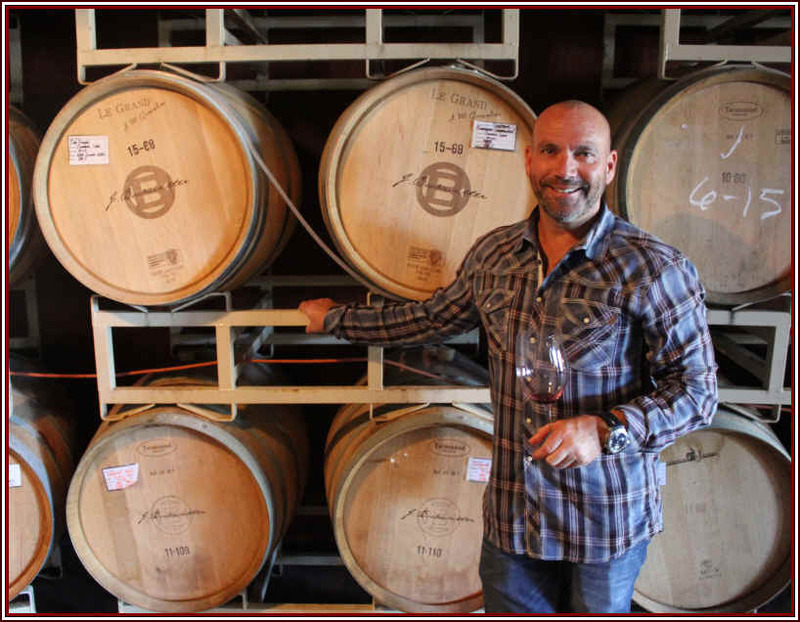 Gary Figgins planted his first vineyard in Walla Walla on a little site originally owned by Francesco and Rosa Leonetti. 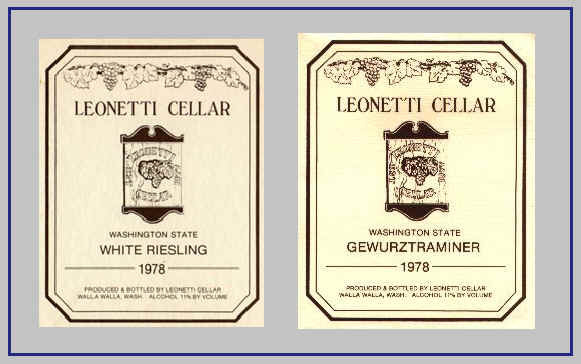 Helped by his uncles Bill & George, Leonetti planted Cabernet & Riesling in 1974 and vinified his first commercial wines in 1977. Figgins and another Walla Walla pioneer, Rick Small (Woodward Canyon winery) had discovered California wines when they were at the Army Reserve base in California's Fort Ord. Gary credits the early vintages they enjoyed made by Napa's Joe Heitz, another old military-man-turned-winemaker. They had discovered the 1968, 1969 and 1970 bottlings by Heitz and this helped set Figgins on his quest for equally great wines. Maybe even better. They began making tiny quantities of varies and sundry wines, including Riesling and Gew�rztraminer. 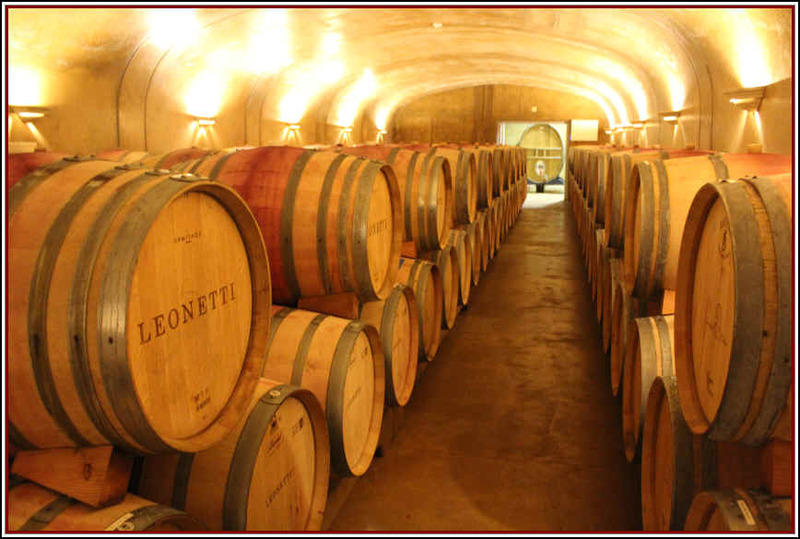 We had been buying the Leonetti wines fairly early on once the winery was big enough to ship a few bottles to San Francisco. In the days before the internet we contacted the Figgins using a device called a telephone and being the modernistas they are, Gary had recorded an answering machine message where he sounded quite like Saturday Night Live's character, Father Guido Sarducci. His a-message was that they don't-a have-a enough-a wine-a for-a their-a own-a table," so sorry. 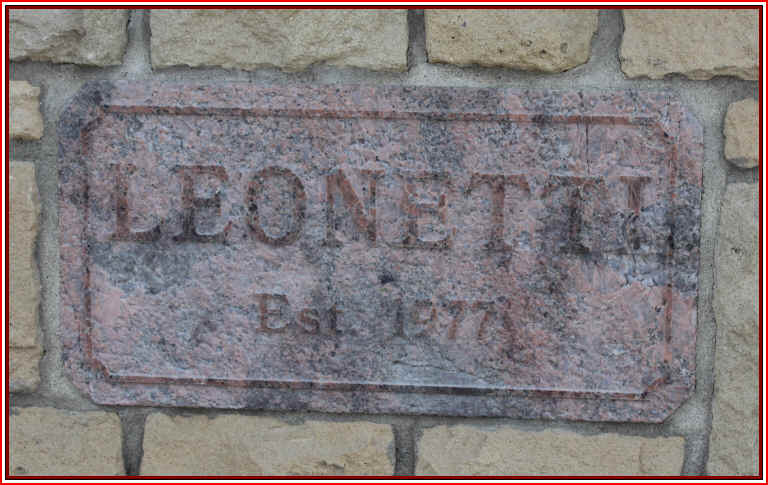 Leonetti was one of the first West Coast "cult" wines in the days following other cult producers such as Inglenook, Beaulieu Vineyard, Louis Martini, etc. Over the years the enterprise has grown and now they make wines from seven different vineyard sites, owning several of them and having an ownership share of a few others. As of 2016, production tallies to about 6,600 cases annually, depending upon the vintage. These days the place is being run by Figgins' son, Chris. He's tweaked the winemaking a bit and they're working to continue to have top-notch fruit sources. 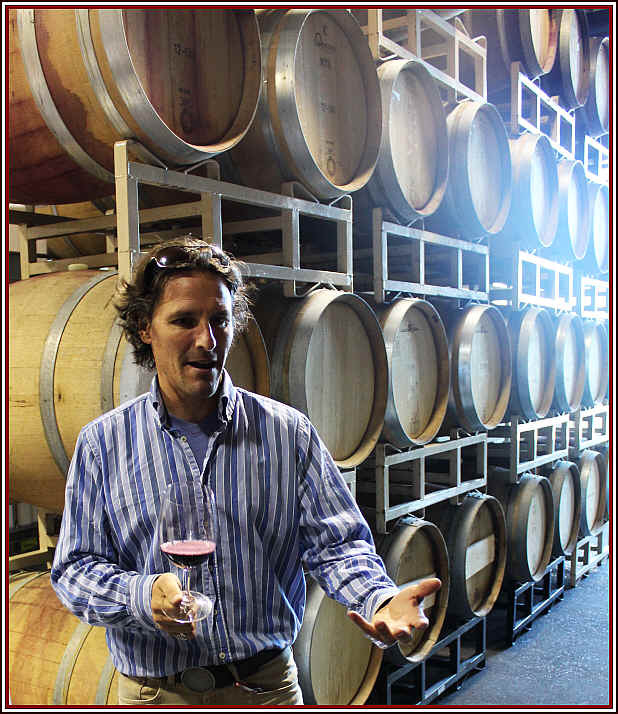 Figgins now has his own eponymous label along with a project in Oregon's Willamette Valley to produce Leonetti-Quality (we hope) Pinot Noir. 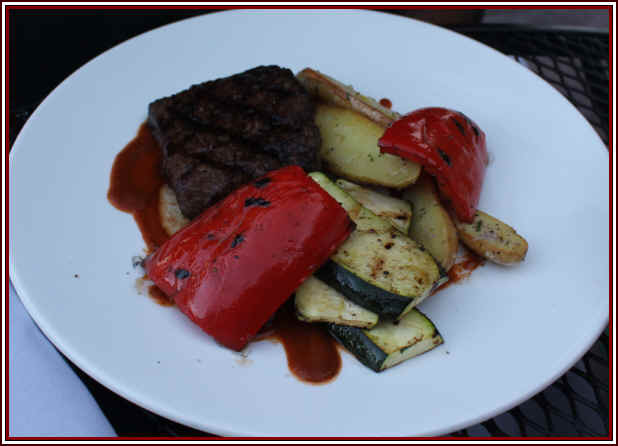 And there's even a cattle-raising company (Lostline Cattle Company) if you're interested in a side of beef to go with a bottle of Leonetti Cabernet! 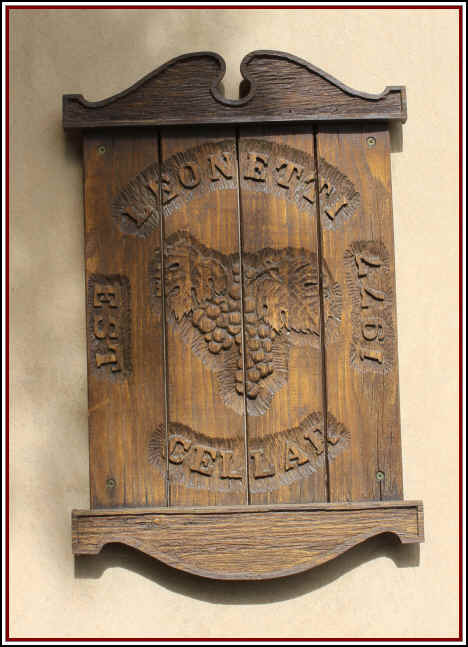 AGL means Leonetti will soon have an Aglianico from locally-grown fruit. It's a tip of the cap to their ancestry. Having been a fan of Leonetti wines in the early days, we can say the wines have changed over the past decade and this is noticeable. 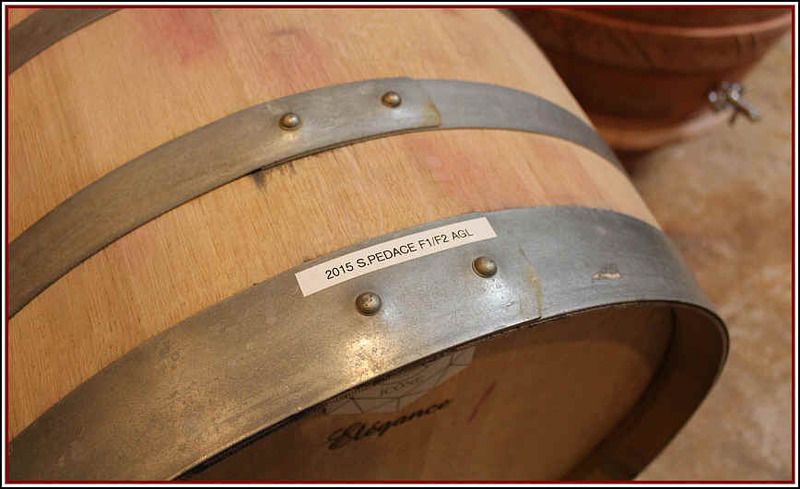 In tasting some recent vintages, it's apparent that the oak regimen is different. 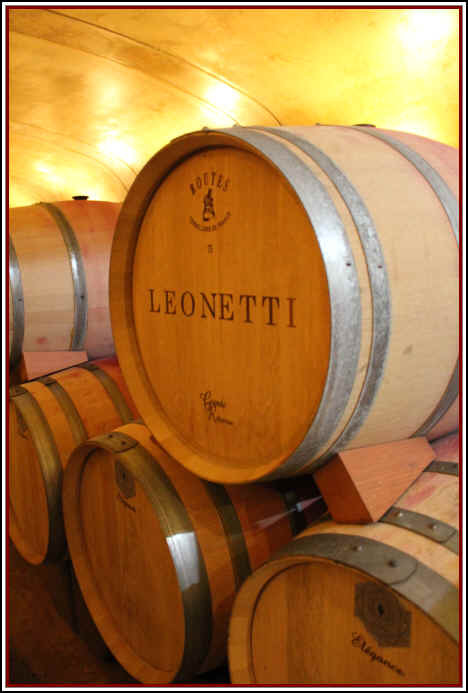 When Chris Figgins took over directing the winemaking, he chose to eliminate the use of American oak cooperage in the Leonetti wines. Whether consumers find this to be an enhancement, or not, we will leave it to others to decide. For our own personal tastes (and remember, we grew up appreciating the use of American oak in top Napa Cabernets as well as in classically-styled Rioja wines from Spain), we liked the broad spectrum of woodsy, cedary notes in the Leonetti wines. Today's Leonetti bottlings are of good quality, but we find a few members of the current "orchestra" are missing and so the wine is simply a bit different. The wines still garner high numerical point scores from the various critics and I don't think any have noticed the change, frankly. Maybe we are the only voice to find the wines are simply a tad less flashy with banishing the American oak? Still, the wines remain good quality, certainly. With more than 1600 acres of vineyards, Ste. Michelle is Washington State's wine "ambassador". It's sister company, Columbia Crest, owns 2,000 acres. Both are owned by Stimson Lane, a company which is a subsidiary of U.S. Tobacco. Who would expect that Chateau Ste. Michelle Fume Blanc and Skoal Chewing Tobacco would be "cousins"? Today, what with one company swallowing up another, Ste. Michelle Wine Estates (it was called Stimson Lane until just recently) is now under the conglomerate called Altria (its roots are in tobacco and snuff, but Philip Morris Tobacco is under their ownership and they own Kraft General Foods...suffice it to say, this once little wine company is now the big fish in the modest-sized Washington State "pond." They make scads of wines...there's a winery devoted to white wines and another to making red wines. Joshua Maloney makes their red wines, while Wendy Stuckey takes care of the whites. Overseeing the two is Bob Bertheau whose title is "head winemaker." They make a tremendous range of wines, from basic, simple stuff to their vineyard-designated series to deluxe, premium quality wines. 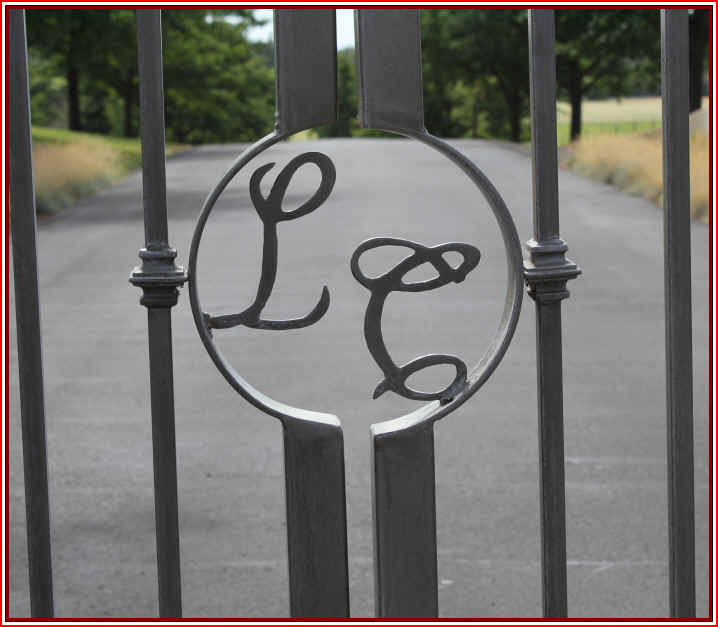 Stimson Lane tried to lure the owner of Chateau Pichon Lalande to collaborate with them on a Cabernet project as Chateau Mouton-Rothschild has done with Robert Mondavi, creating Opus One. She turned them down...In fact, May Eliane de Lencquesaing asked ME what I thought about her teaming up with these people. Back in those days, Ste. Michelle was not exactly making wines in the same league as Pichon Lalande and I told her so...they would gain more by her being associated that she'd gain. In fact, it might have taken some of the luster off her own wonderful estate. Today, though, Ste. Michelle has a number of collaborative projects. Well, Ste. Michelle Wine Estates does. 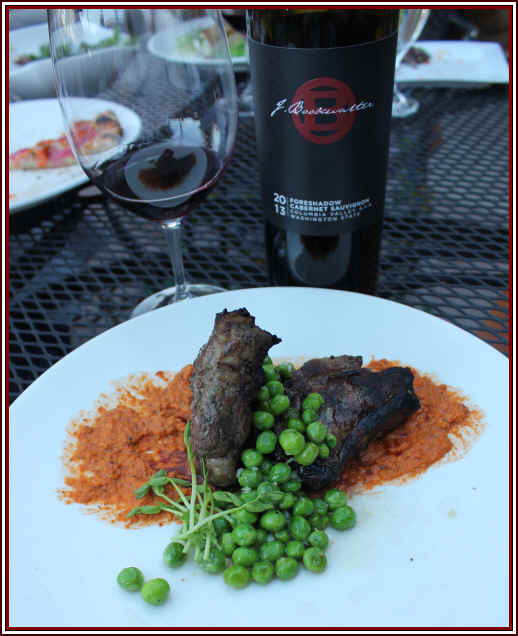 With Italy's Antinori family they make a Washington State Cabernet called Col Solare. In Napa, they own a brand called Antica. In Chile, there's the Haras de Pirque brand of wines. With Germany's famed winemaker, Ernst Loosen, they make a Riesling in Washington called "Eroica." I've suggested they add the letter "t" to this in order to stimulate the brand's popularity. The Ste. Michelle brand produces reliable-quality wines. It's a bit like Washington's version of the Robert Mondavi winery of the 21st Century: nicely made wines, maybe not the most inspired, but at least they're well-made. You'll find the wine of Ste. 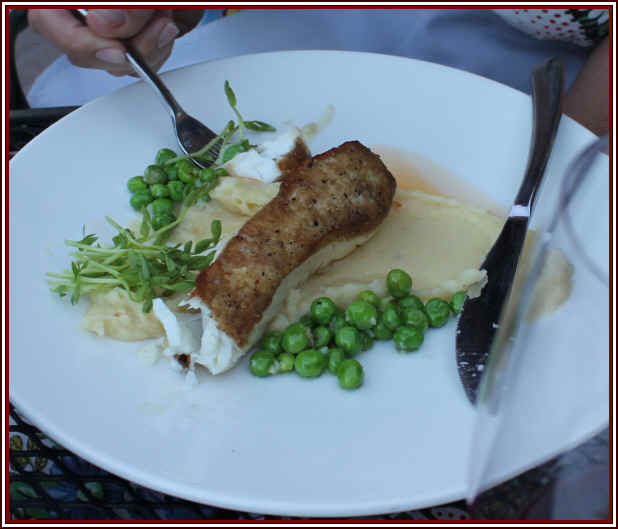 Michelle and its sister, Columbia Crest, to garner great accolades from publications such as The Wine Spectator. We must remember that this company also spends a considerable amount of money on advertising. Some people suggest there's a correlation between advertising dollars and favorable reviews. We taste these from time to time. Some wines are better than average, but we've not found wines as interesting as those from Woodward Canyon, Leonetti or L'Ecole 41, frankly. The brand is so huge these days, they target their sales efforts in stores such as grocery businesses like Safeway and Lucky or chain operations such as Trader Joe's. There is no reason for an independent wine shop such as Weimax to carry these wines. 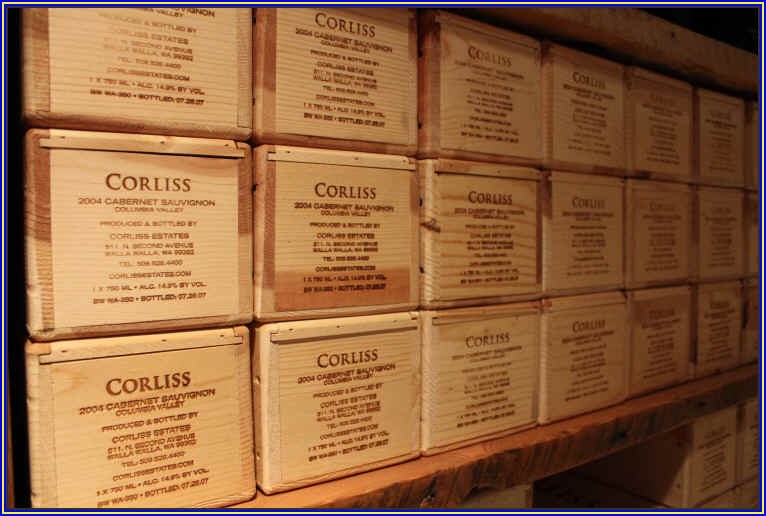 Corliss is a new name on the West Coast wine scene. It's that of a Seattle-based real estate mogul and wine geek, Michael Corliss. This is a fellow who was on the Board of Directors at a bank or two, sat on the board of Pepsi, has a building supply company, etc., etc. etc. And, being a wine geek, the lure of seeing one's name on a bottle of premium wine is mighty tempting, especially when you have a few bucks to play with. 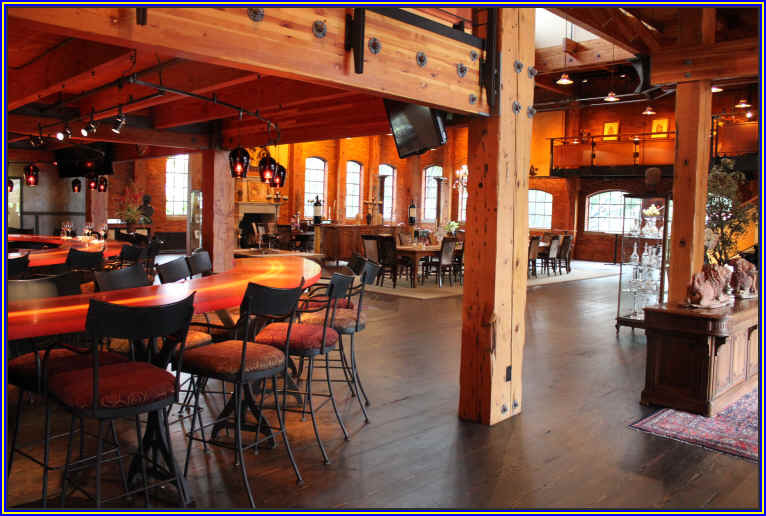 Mr. & Mrs. Corliss, then, purchased an old bakery building in Walla Walla and refurbished the place, converting it into a winery. Standards are high, we're told, as they apparently poured the first two vintages down the drain as they weren't worthy of the Corliss label. 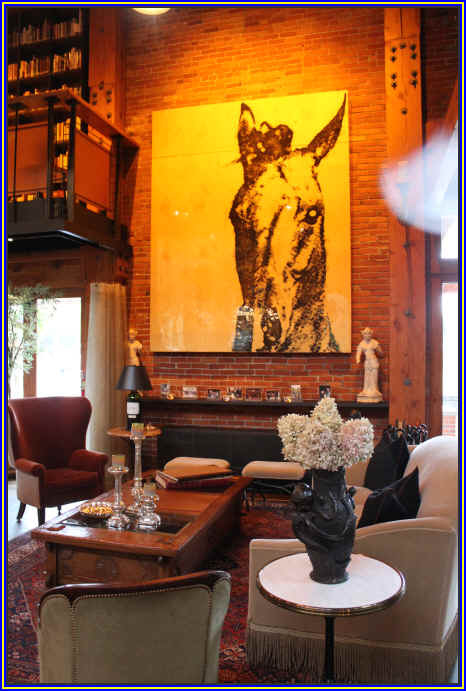 The winery is a bit of a show-place and the tasting and sales area features an impressive array presentation sites...some have a formal tasting table or tasting bar, while others resemble the living room comforts of a private club. 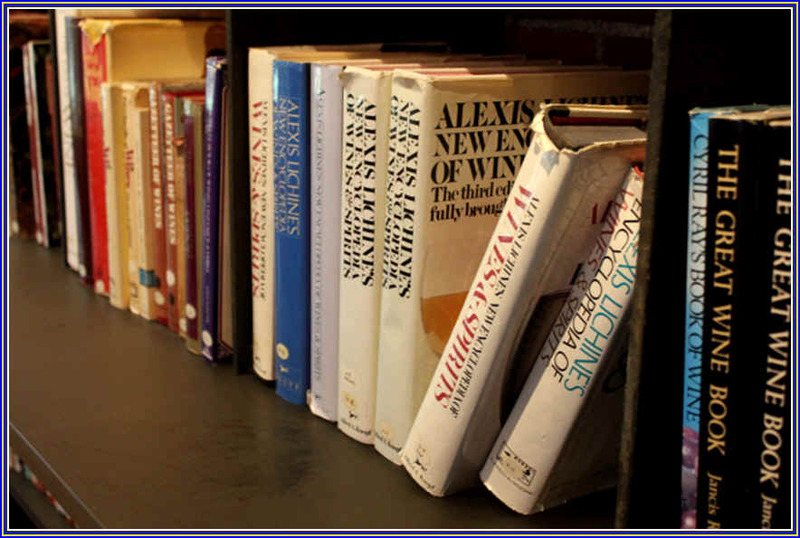 There's quite a library of wine and food books...this snapshot is of but a small set of book-shelves on the downstairs level. More are housed on a second level in the building. But we spoke too soon! Tucked into this copy was a type-written letter from Bob to an Atlanta wine store owner explaining the benefits of the shop having a stack of Bob's books for sale. 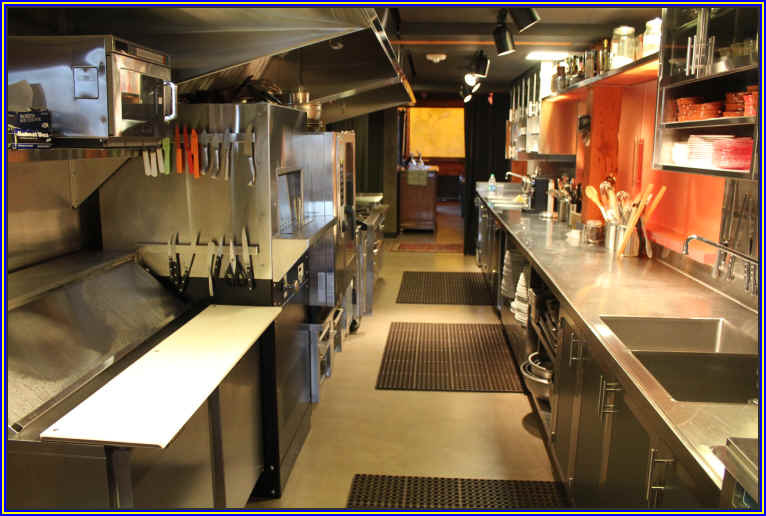 The facility has a commercial kitchen, allowing Corliss to host major Bacchanalias! The cellar is impressive, too. 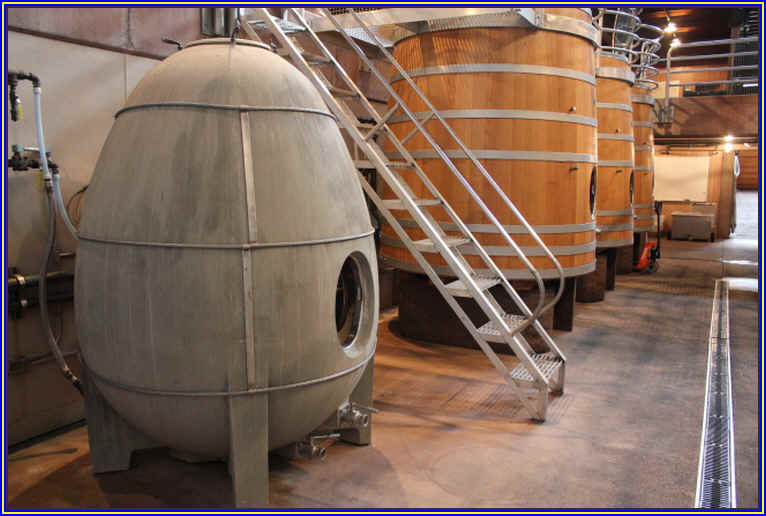 There are several "lifts" allowing them to place a tank or barrel on it, elevating the container to rack the wine using gravity rather than a pump. 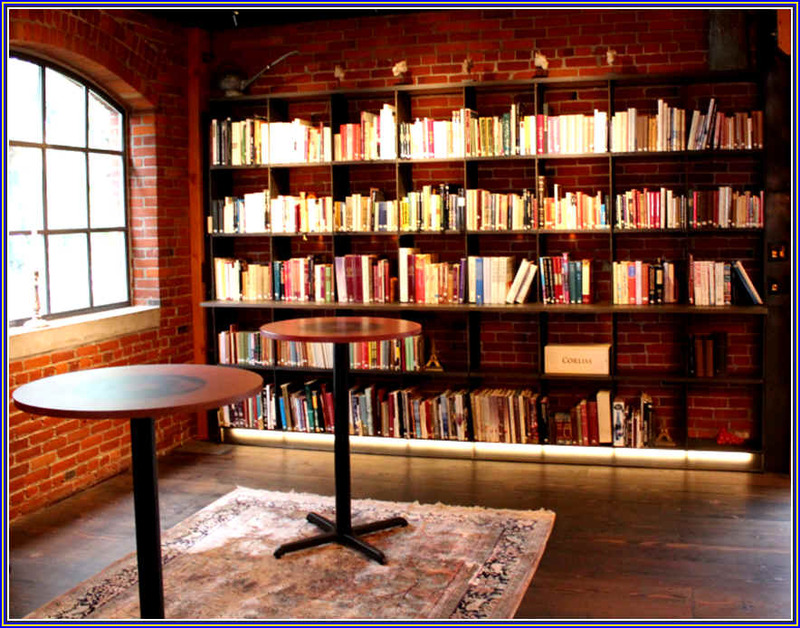 They have a second "library" of sorts and this is certainly impressive. They own several vineyard sites. Red Mountain is one source of Corliss fruit. They now own 350 acres in that AVA, accounting for 40% of the appellation! In the Yakima Valley AVA they own a vineyard site called Blackrock. 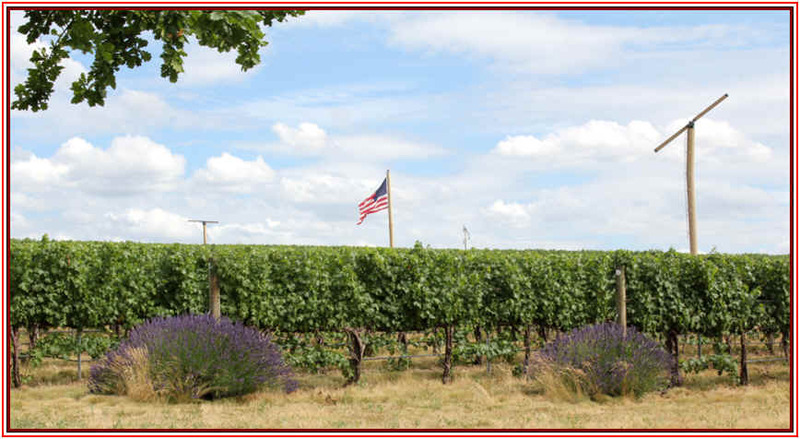 Within the Walla Walla appellation is the Blue Mountain Estate, a 180 acre site with a bit more than 50 acres planted currently. The wines are offered in really heavy glass bottles...these have a hugely deep "punt" to them and our late colleague, Bob Gorman, used to say they "easily pass the proctologist's test." And you know how some artisan wines have a wax seal on the cork? Well, Corliss puts the wax seal in the punt of the bottle. 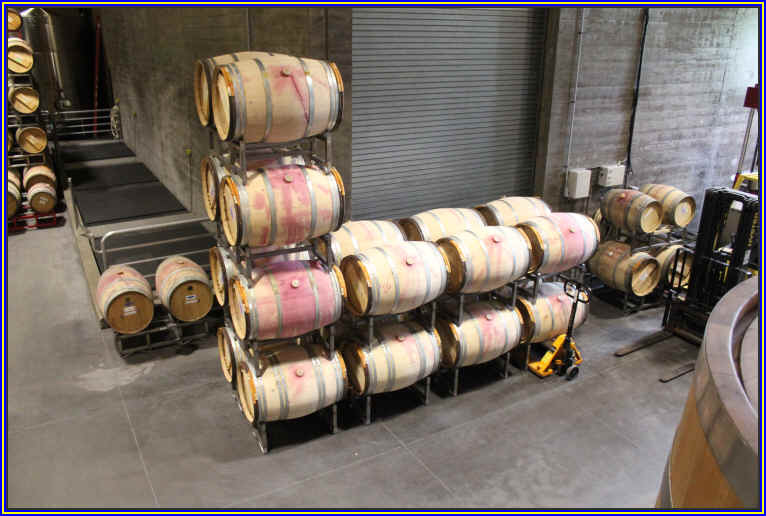 We ventured to the winery in the summer of 2016 and, though they knew we are in the wine business and have had their wine in the shop, they did not show us any current vintages, upcoming wines or older bottlings. "We're sold out." they told us. Sure, but there are new releases coming in a few months, no? Apparently they don't need to sell wine at Corliss...it sells itself. 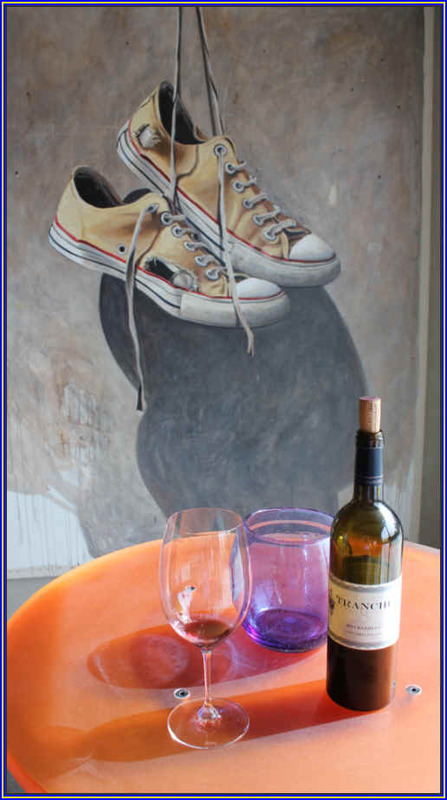 There's a sister brand of wines called Tranche Cellars. We purchased a bottle of both the red and white wines called "Slice of Pape." The white is a Roussanne/Viognier blend...big, flat and ponderous. The red wine features Grenache and Syrah and this, too, needs some work. On the same day we visited Corliss, we stopped in at Tranche...the wines have improved a bit, but we did not find anything of great interest. A Sangiovese and Tempranillo were pleasant bottles and they have slashed the prices dramatically, suggesting the market has sent them a message. Here's an ambitious project from a couple of choir boys in Washington. It's called Tenor and you'll need well more than a "ten-er" to buy a bottle of their 1:1 blend. 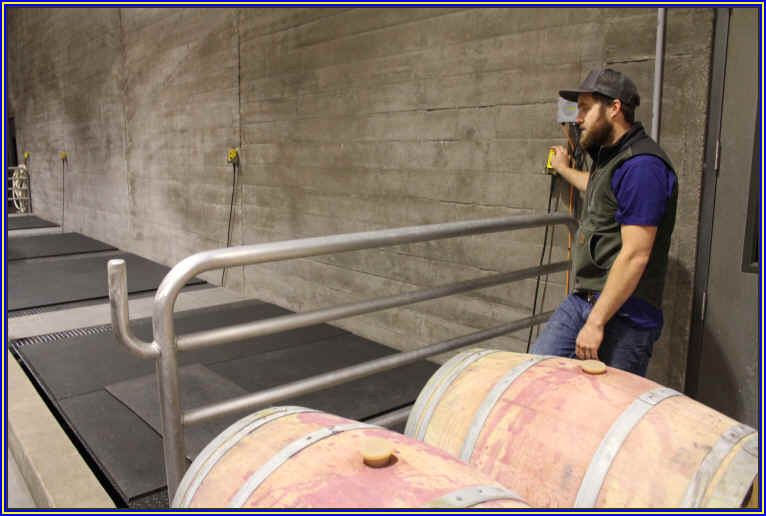 The winery is the work of a young fellow named Aryn Morrell who spent time with Golden State Vintners and the prestigious Edgewood Estates in Napa. The Tenor of their argument is that they only offer a wine when it's of an elite level and superlative quality. 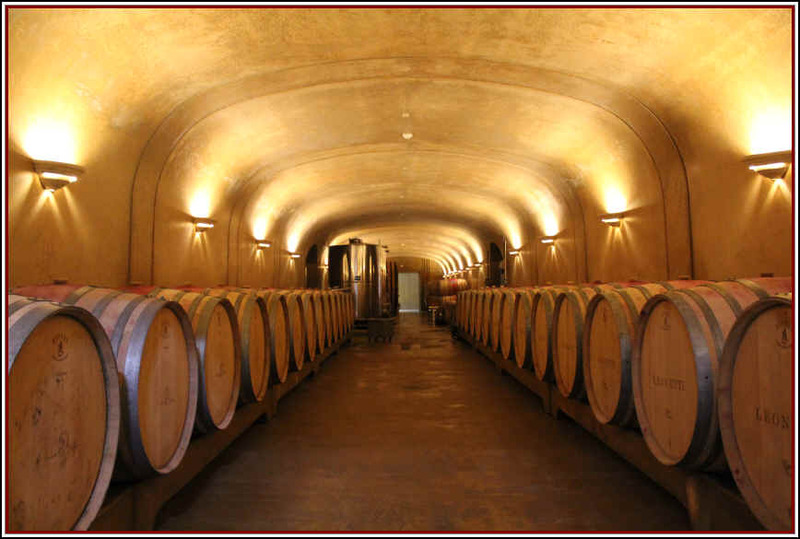 The Tenor web site indicates, for example, if you were to line-up the world's top Merlot wines from the 2008 vintage, the 2008 Tenor would be in the discussion. If a varietal wine is thought not to be a "player" in this noble battle, then they will not offer it. 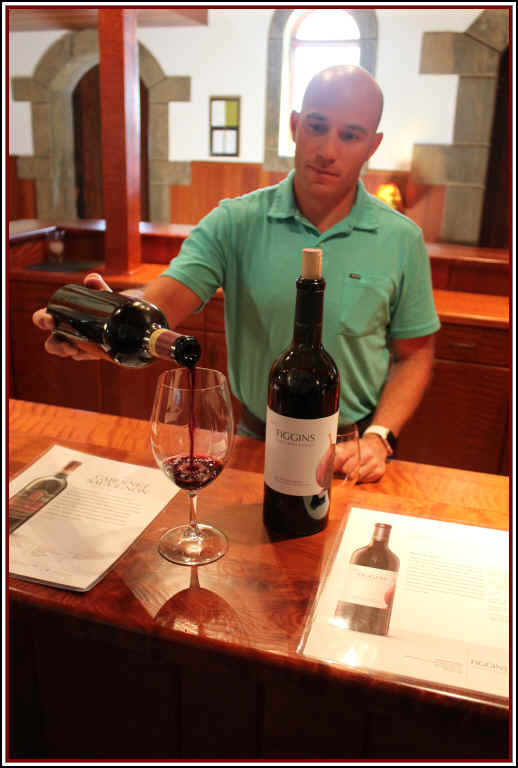 In 2007, for example, the Tenor varietal bottlings included just Merlot and Malbec. In 2008, the roster was comprised of Syrah, Merlot and Cabernet. And then they offer not "Opus One" (that name was already taken, apparently), but 1:1 (One of One). How brash and ballsy are the Tenor boys? 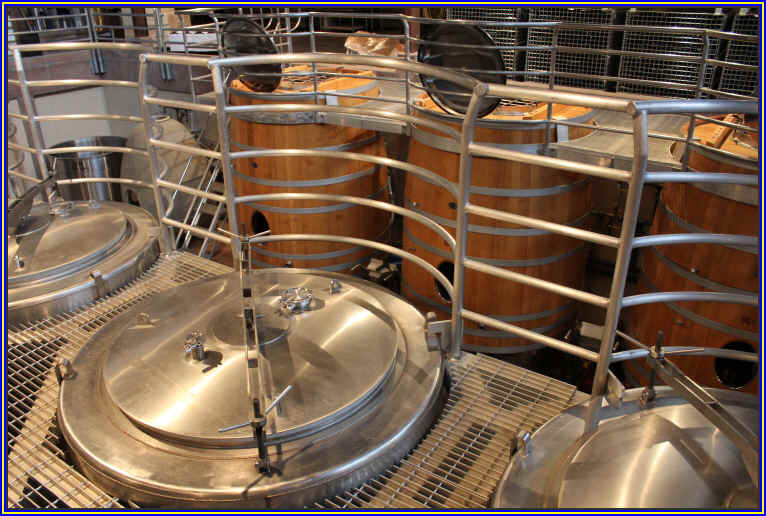 Here's their "promise" of quality as posted on the winery website. 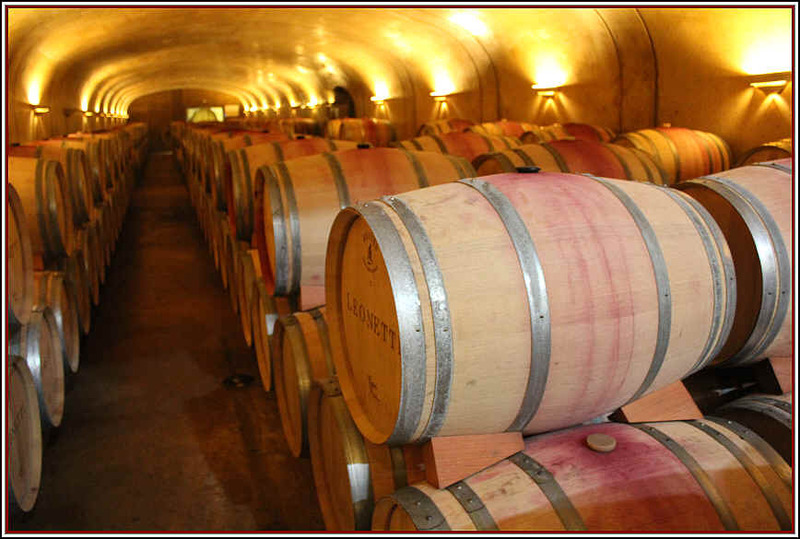 At Tenor, we produce only the finest expressions of single varietals in a vintage, along with one proprietary blend. We believe that Tenor makes world-class wine. To that end, we invite you to participate in "The Tenor Promise". Make an appointment with our Brand Manager, Eric Swikard to bring any 95pt* (or higher) wine from the same year and same varietal as a Tenor wine. 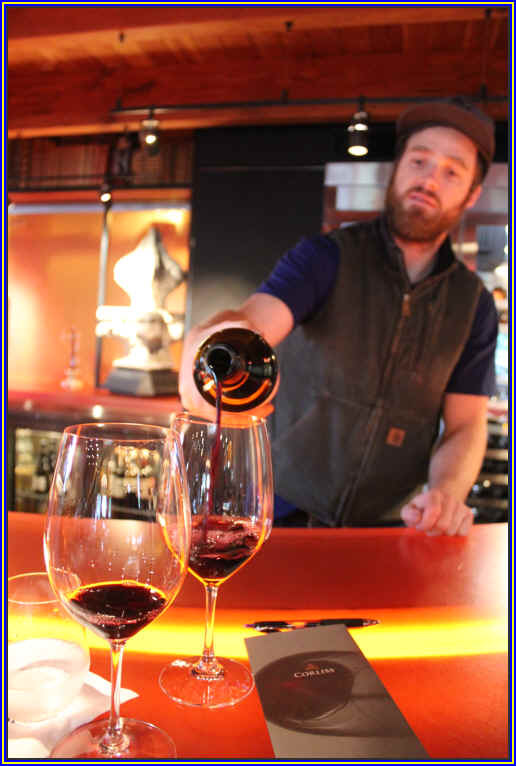 In the tasting room, we will decant your wine, along with the Tenor wine and another 95pt wine (or higher) of our choosing, all from the same vintage and same varietal. Together, we will taste all three of these wines... blind. At the end of our tasting, if you don't agree that the Tenor wine is in the same class as the other 95pt (or higher) wines, we will replace the bottle you brought in within 10 days. If you do find that all the wines are in the same class, we will replace your bottle with a Tenor bottle of wine (with purchase of 3 or more wines). We tasted two vintages of 1:1. I'm a bit surprised they'd put their wine in a blind-tasting alongside wines with high numerical scores. Typically the wines with high point scores are "extreme" wines and have inky color, lots of oak and over-the-top fruit. The Tenor wines struck me as being a bit restrained and not made with the idea of appealing to Parker or The Wine Dictator. The 2007 showed a bit of cassis and herbal notes. It's a medium-full bodied red with a faintly woodsy note. This may evolve into a grander wine with time. I'd peg it as a nice Medoc at this stage from a medium-good vintage. Production amounted to 120 cases. 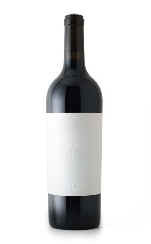 The 2008 is a wine of larger proportions, darker in color and a bit more profound in terms of complexity. There's a plummy aspect here and a hint of a brown spice component. It's a fairly well-structured wine and we expect it to cellar well for a decade, or so. They claim to have produced 141 cases of this vintage. Allow the bottle to warm to slightly below room temperature before opening. 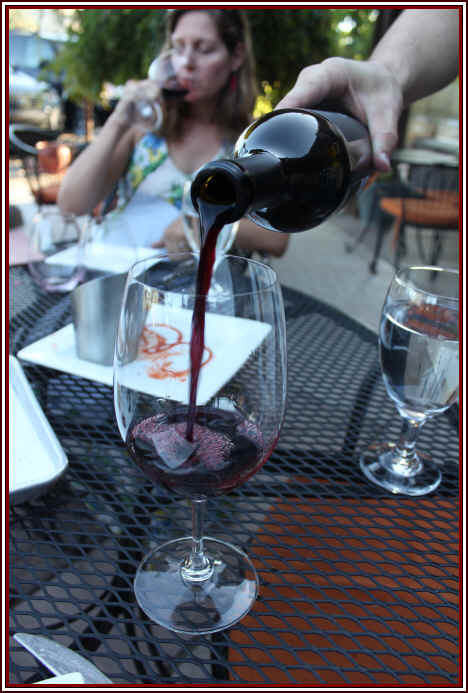 Pour the wine into a decanter and swirl mildly every 15 minutes over a period of 45 minutes to an hour. Your glassware should be tall and broad, preferably Cabernet in style. The ideal glass is the Riedel Vinum XL Cabernet. A fellow who's viewed as either a gambler or an investor (or both) purchased some scrub land near Royal City, Washington back in 1968. Tom Alberg Senior made that bet when he purchased more than 200 acres of dirt in Eastern Washington state. But it wasn't until the turn of the century that Tom Alberg Junior began cashing in on his father's wager. And Junior is an even bigger gambler (a lawyer and venture capitalist) than the old man, as he started planting grapevines on that property in what's called Frenchman Hills. He met former Chateau Ste. Michelle winemaker Mike Januik who suggested they launch a little wine venture together and thus was born the Novelty Hill winery. The name comes from another property Alberg's dad owned some 20 minutes' drive east of Redmond (less than an hour from Seattle). 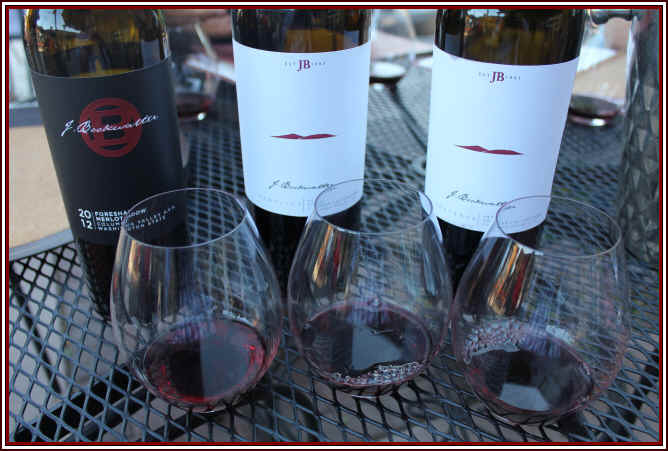 Januik was starting his own winery and they made wines of both the Januik and Novelty Hill brands in a warehouse in Woodinville, Washington, not far from Ste. Michelle. 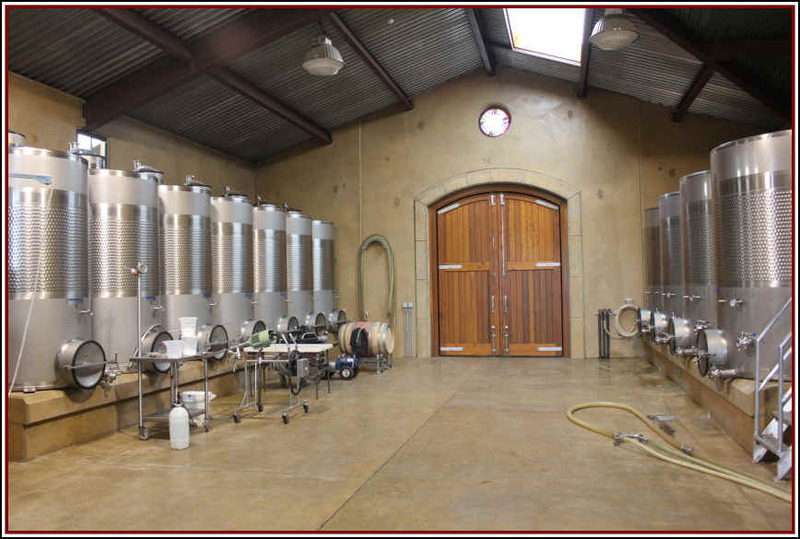 By 2007 Alberg built a sizeable winery and event center and both Januik and Novelty Hill wines are made there today by Mike Januik. Some people initially felt Novelty Hill was a second label of Januik's, but it's its own brand with much of the fruit coming from Alberg's Stillwater Creek Vineyard. We included Novelty Hill Cabernet in a blind tasting not too long ago and the wine was not only good quality, but it's well priced, too. The 2014 has 4% Merlot, 2% Cabernet Franc and 2% Malbec in the blend. 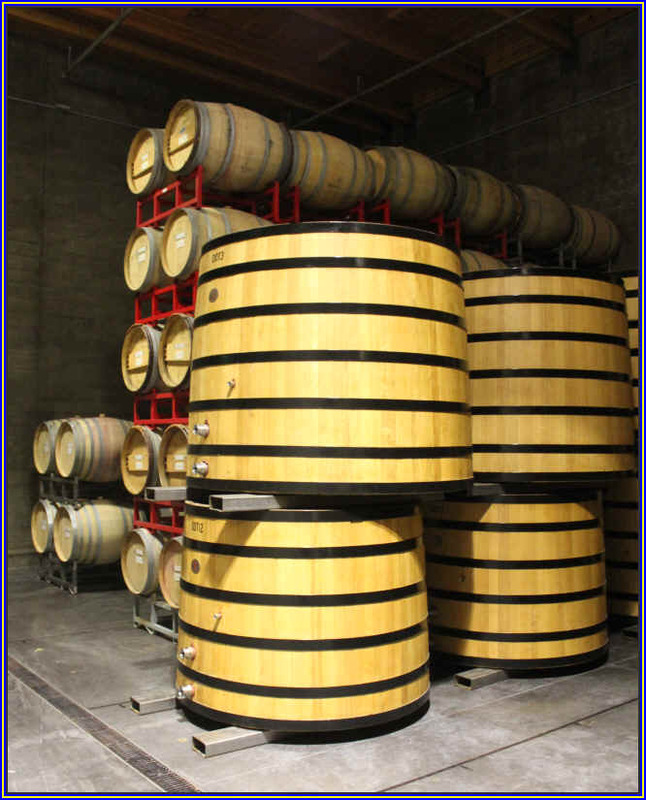 It was matured for 21 months in both French and American oak cooperage with about 40% of the barrels being brand new. The wine displays nice dark fruit notes and there's a balancing level of wood coming through on the nose and palate. It's quite drinkable now and should last another 5+ years.